An unusual feature embedded deep within a fragment of a Martian meteorite is helping to make the case for the possibility of life on Mars. The finding of a ‘cell-like’ structure, which investigators now know once held water, came about as a result of collaboration between scientists in the UK and Greece. Their findings are published in the latest edition of the journal Astrobiology. While investigating the Martian meteorite, known as Nakhla, Dr Elias Chatzitheodoridis of the National Technical University of Athens found an unusual feature embedded deep within the rock. In a bid to understand what it might be, he teamed up with long-time friend and collaborator Professor Ian Lyon at the University of Manchester. These findings are significant because they add to increasing evidence that beneath the surface, Mars does provide all the conditions for life to have formed and evolved. It also adds to a body of evidence suggesting that large asteroids hit Mars in the past and produce long-lasting hydrothermal fields that could sustain life on Mars, even in later epochs, if life ever emerged there. As part of the research, the feature was imaged in unprecedented detail by Dr Sarah Haigh of The University of Manchester whose work usually involves high resolution imaging for next generation electronic devices ,which are made by stacking together single atomic layers of graphene and other materials with the aim of making faster, lighter and bendable mobile phones and tablets. A similar imaging approach was able to reveal the atomic layers of materials inside the meteorite. Together their combined experimental approach has revealed new insights into the geological origins of this fascinating structure. Publication: Chatzitheodoridis Elias, et al., “A Conspicuous Clay Ovoid in Nakhla: Evidence for Subsurface Hydrothermal Alteration on Mars with Implications for Astrobiology,” Astrobiology, 2014, 14(8): 651-693; doi:10.1089/ast.2013.1069. 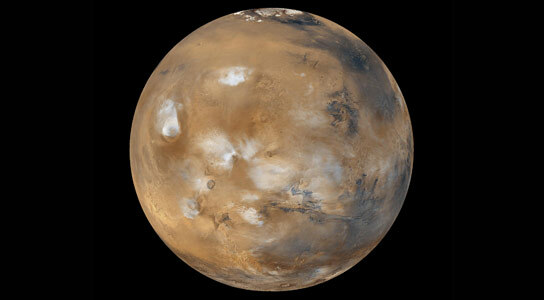 Be the first to comment on "Martian Meteorite Reveals the Possibility of Life on Mars"